Sodium Lauryl Sulfate (SLS) Market size was more than USD 450 million in 2015 and is likely to exhibit a CAGR of over 5% over the forecast timeframe. 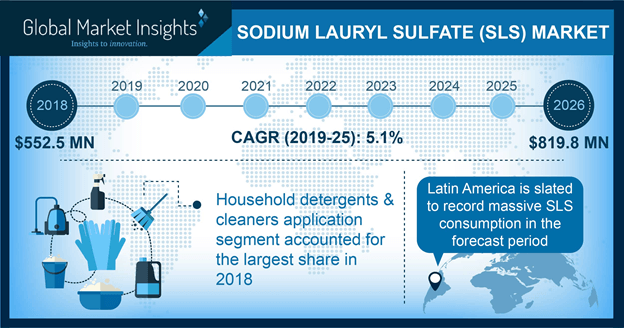 Rising demand for household and industrial detergents and cleaners will likely have a positive impact on the global sodium lauryl sulfate market in the forecast spell, which is an organic chemical surfactant with extensive applications in manufacturing detergents and other hygiene related products. Increasing awareness towards personal hygiene along with household and workplace cleanliness owing to several government initiatives and mandatory regulations will have a significant influence on the product demand. With the prevalence of several disease-causing agents in the environment, cleanliness and healthy living standard is becoming a major global concern. In 2015, global household detergents demand was more than 30,000 kilo tons and it will witness growth at a decent rate in the coming years boosting the overall SLS market demand. Sodium lauryl sulfate (SLS) market will be restrained by certain health and environmental hazards associated with the product. The product causes severe ocular irritations and hair loss at concentration more than 0.1% (w/w) and dermal irritations at concentration more than 2% (w/w). Disposal of the cleaning agents through sewage releases the chemicals in the aquatic environment, where it may pose moderately adverse effects to the living organisms. Claims of carcinogenic effects of the chemicals may also pose threats to the SLS market growth in the coming years. Global SLS market has been broadly classified into liquid and dry product types, with dry types available in the form of powder, needles, and granules. Dry SLS products are gaining popularity and will likely exhibit a faster growth rate in the forecast span owing to its ease of storage and transportability. In 2015, this product segment generated close to USD 250 million and will witness a CAGR more than 5% in the next eight years. Needles with up to 95% concentration find application in rubber industries and nutraceuticals in addition to personal care products, detergents, and cleaners. SLS needles market was worth more than USD 100 million out of the overall dry SLS market in 2015. The liquid form, in 2015, generated revenue more than USD 200 million for the overall SLS market, and it will exhibit a decent growth in the coming years owing to its extensive application in detergents and personal care products, especially in pearlescent, opaque, and cream products. They have a high miscibility with other chemicals and are comparatively cheaper than the dry product types, making them a popular ingredient in several end products. Sodium lauryl sulfate market applications are in household detergents & cleaners, personal care products, dish washing liquids, industrial cleaners, and others including paints & coatings, rubber, polymer additives, etc. SLS, being an effective anionic surfactant and foaming agent, finds extensive application in household detergents & cleaners which accounted for over 40% of the overall SLS market in 2015. The increasing population and number of households in the emerging nations will bolster the global SLS market demand for household detergents & cleaners, making it the fastest growing application segment in the coming years. Personal care products registered a revenue over USD 90 million in 2015 and will likely witness a healthy growth in the next few years. They are extensively used in shampoos, bath bombs, soaps, facial creams and scrubs, and other personal care products due to their high foaming properties. Increasing personal consciousness coupled with heavy commercialization of dermal and hair care products will have a positive impact on the product demand in personal care products. Huge population along with residential and industrial buildings in Asia Pacific makes the region a high prospect for the global SLS market for the upcoming years. Emerging nations such as China, India, and Japan will contribute to the product demand in terms of high demand for detergents and personal care products. Increasing personal purchase parity coupled with government initiatives to maintain clean infrastructures will influence the overall SLS market in the next eight years positively. In 2015, Asia Pacific generated more than USD 100 million and will likely exhibit growth at close to 5% CAGR up to 2024. North America, led by the U.S., accounted for more than 15% of the global SLS market share in 2015. The region will witness a sluggish growth rate compared to other regions due to detergents and personal care products market maturity. Moreover, increasing trends of using organic personal care products and growing popularity of other substitutes of the product in the region will also contribute to the slow growth rate in the region. SLS market competitive landscape is highly fragmented with the presence of several large and medium scale manufacturing companies. Dominance of large conglomerates such as BASF SE, The Dow Chemical Company, and Huntsman Corporation across the product value chain as raw material manufacturers as well as product manufacturer and distributor characterizes the global SLS market. Other key manufacturers include Solvay S.A., Sasol, Croda International, Oxiteno, Stepan Company, Galaxy Surfactants, Godrej Industries, Kao Corporation, Clariant Corporation, Melan Chemical Co. Ltd., Taiwan NJC Corporation, Miwon Commercial Co. Ltd., and Xiamen Ditai Chemicals Co. Ltd.
Companies rely on extensive merger and acquisition activities to hold sway the industry. For instance, Solvay S.A. acquired Rhodia in 2011 to strengthen their market position and expand their product portfolio. In 2012, Oxiteno took over Uruguay-based American Chemical ICSA to boost their hold on the regional SLS market. SLS market growth is directly proportional to the product demand in household & industrial detergents and personal care products. Increasing awareness regarding cleanliness and healthiness in the emerging countries of Asia Pacific, Latin America, and Middle East & Africa will have a significant impact on the global product demand. The product also finds application in other industries such as rubber and paints and coatings due to their superior foaming and wetting properties.